Here’s the inside story on enjoying shellfish from Vineyard waters: everything from where to find them yourself – either in the water or at a fish market – to how to whip up some delectable dishes that are sure to please the seafood lovers in your life. 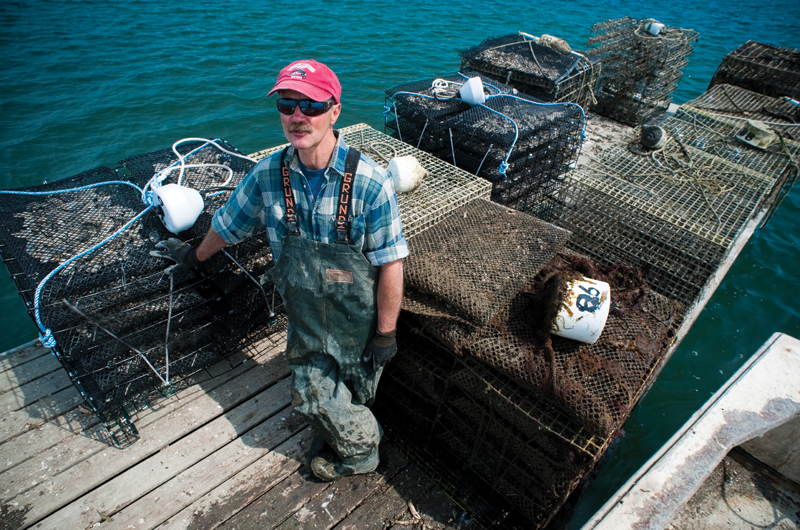 Scott Castro runs an oyster-growing operation in Katama Bay. More commonly known as steamers, these clams have a soft shell made from calcium carbonate that breaks easily, as opposed to the thick, hard-shell quahaug clams. From six to ten inches under the sand, steamers send up “siphons” to the surface to draw in water for nutrients, before expelling it and leaving the visible holes that clammers look for when hunting soft-shell clams during low tide. Most commonly, soft-shells clams are steamed, dipped in the broth to remove any remaining sand, then dipped in butter or simply fried. Regulations and locations: Steamers are measured lengthwise and must be at least two inches long to be harvested. Soft-shell clams can be found in Tisbury Great Pond, Katama Bay, Tashmoo, Menemsha Pond (though limited), Lagoon Pond, and Sengekontacket Pond (when it’s not closed, as it is this summer). Selecting and storing: Clams can be stored for several weeks unopened in the refrigerator, allowed to breathe. Shells may gape, but should close right away if you tap them. If you plan to cook the clams in a paella or linguine (not eat them raw), you can also freeze steamers in the shells, then defrost and cook. Quahaugs have figured prominently as a Vineyard food source for thousands of years. They are used traditionally in clambakes and for the ubiquitous clam chowder, as well as in kitchens throughout the Island, whether stuffed, broiled with butter and herbs, or combined generously with linguine, to name a few uses. Quahaugs are classified by overall length. Littlenecks are the smallest size, up to two-and-a-half inches in length, followed by cherrystones, two-and-a-half to three inches – both of which are used in raw bars and for pasta and paella dishes. The chowder quahaugs – identifying one of their prime uses – are longer than three inches. Regulations and locations: A quahaug must be at least one inch thick to be legal. Using your foot or a clam rake, quahaugs are collected at low tide, found buried one to two inches in the sand or mud. Quahaugs can be found in major coastal ponds, including Menemsha and Quitsa ponds, Katama Bay, the Lagoon, and Tashmoo, all spots where shellfish departments add millions of quahaug seed each year to bolster supplies. Selecting and storing: Like soft-shell clams, quahaugs can be stored for several weeks unopened in the refrigerator, or you can also freeze them in their shells, then defrost and cook them. The Vineyard is on the northern edge of the range for the blue-claw crab – best known and most plentiful in the mid-Atlantic Chesapeake region and a prized delicacy for its sweet, tender meat. There isn’t any commercial crabbing on Martha’s Vineyard – most of the catch taken here is done recreationally by kids and families who as a tradition enjoy netting this speedy and feisty crustacean for a crab boil or crab cakes. The habitat for blue crabs on Martha’s Vineyard includes many of the Island’s coastal ponds and creeks, but abundance varies from year to year, depending on natural cycles. You don’t need a permit, just a long-handled dip net and a floatable fish tote or bushel basket to hold the crabs. Regulations and locations: Crabs must measure five inches in body width point-to-point. Daily limit, according to state law, is fifty, and it’s illegal to take any females carrying eggs (a visible orange mass on the crab’s underside), though many avoid taking females at all. Try Edgartown and Tisbury great ponds and Chilmark Pond along the south shore, and Upper and Lower Trapp’s Pond in Edgartown. Selecting and storing: These are best cooked the day of catching. If not consumed right away, they can be cooked, then picked the next day to use the crabmeat for crab cakes, salad, or chowder. Colorful buoys signaling a lobster trap below dot the waters around the Island, and people love to indulge in this popular and pricey shellfish, but all is not well with local lobsters. A report out this year, which points to a troubled future, noted a decline in both adult and juvenile lobsters in Vineyard waters, making it difficult for lobstermen to depend upon this industry for a living as they once did. Scientists believe warming water temperatures and environmental problems may be in part to blame for the changes. This is a contrast from just a few decades ago when Vineyard lobstermen supplied our markets and had more than enough to export off-Island. “Now 90 percent of our lobsters have to be shipped in,” Louis Larsen, owner of the Net Result fish market, recently told the Vineyard Gazette. With an eye toward any changes that could make a difference, there is talk of seeking funds to reactivate the Oak Bluffs lobster hatchery, which has been dormant for nearly a decade. Regulations and locations: A recreational family permit to take lobsters for personal use can be obtained through the Massachusetts Division of Marine Fisheries (see the website www.mass.gov/dfwele/dmf for an application). You can set up to ten pots, and harvest up to fifteen lobsters (excluding egg-bearing and breeding females) per day, as long as the length of the carapace (body shell) measures at least 3 3/8 inches. The recreational permit can also be used by the holder to dive for lobsters. Selecting and storing: Store lobsters in a cool spot or the refrigerator until ready to cook. If necessary, they will keep in the fridge four to five days. You can wrap them in wet paper towels or newspapers after a couple of days to keep them moist. A new idea in open-ocean aquaculture resulted in two Vineyard sites of cultured mussel operations that began in 2009: one off Noman’s Land and another off the north shore, about a mile out from the old Brickyard. Blue mussels are growing in mesh socks off two experimental long lines – one at each site – that are submerged at least twenty feet below the surface; the first harvest is expected this August. According to Warren Doty, president of the Menemsha Fisheries Development Fund, the two young partners in the mussel operation, Tim Broderick and Alec Gale, hope to harvest between 200,000 and 300,000 mussels a year. Warren and others involved are working to create additional mussel aquaculture zones with hopes that more fishermen will operate additional lines in these locations, leading to the year-round harvest of blue mussels off the Vineyard. Regulations and locations: There is no minimum size for wild mussels and no permit necessary. Wild blue mussels can be found attached to rocks along jetties and in rocky waters off the north shore, though fewer than previously because of the area’s rising water temperatures. Selecting and storing: Any open, unresponsive mussels should be discarded before cooking. A rinse in water and removal of the stringy “beard” outside the shells is suggested. They are best cooked the same day, but will keep refrigerated for five to eight days. Store mussels in the bottom of your refrigerator, covered with a damp cloth or wrapped in wet newspaper. After they are steamed, if any fail to open, throw them out. Thanks to a yearly seeding program to bolster the stock of wild Atlantic-born oysters (also termed American) growing in Vineyard great ponds, there is an ongoing supply for recreational and commercial interests. There is also a robust crew of about a dozen Island oyster farmers in both Katama Bay and Menemsha Pond growing cultured oysters in cages and bags hanging off rafts, enough to supply our Vineyard markets and restaurants and beyond with plenty of oysters under names such as Blue Moon, Sweet Neck, Signature, Split Rock, and more. Through grants and the work of the Martha’s Vineyard Shellfish Group and Menemsha Fisheries Development Fund, oyster restoration projects have started in both Edgartown and Tisbury great ponds as well. This can also help improve water quality as oysters filter the water and remove excess nitrogen. Regulations and locations: Oysters are measured lengthwise and must be three inches long to be legal. In some towns, oysters over four-and-a-half inches must be thrown back. The wild harvest season begins in September; farmed oysters are available in markets year-round. To find your own, try Katama Bay, Tisbury Great Pond, and Edgartown Great Pond. Selecting and storing: In the refrigerator, oysters can keep up to a month. “They used to call them potatoes and kept them for months in root cellars – it’s amazing how long they keep,” says Louis Larsen of the Net Result. When out catching oysters, cool them down gradually – don’t bury them in ice after they’ve been sitting in the sun – they don’t want to be shocked, Louis says. “It paralyzes them and they don’t keep as long.” Once opened, keep them flat or the juices will drain. Regulations and locations: The season for bay scallops opens in October and runs through the winter. A legal adult is identifiable by the raised growth line visible on the shell. Seeding happens in Menemsha and Quitsa ponds, Lake Tashmoo, Lagoon Pond, Sengekontacket, Cape Pogue Bay, and Katama Bay. Selecting and storing: This shellfish stores better when shucked immediately after collecting them – and they are easiest to shuck right after being caught. Keep shucked scallops just a couple of days, or freeze for later use. Shellfish need oxygen when stored live in their shells, so it’s best not to store them in closed plastic bags or covered with plastic wrap as they could suffocate. You can store them in a bowl with a damp cloth over them. There’s nothing more satisfying than preparing a meal straight from Vineyard waters, after a few peaceful hours alone or with friends and family at a beautiful spot looking for your buried (or not so buried) edible treasure. A shellfish permit – which covers soft-shell clams, quahaugs, oysters, and scallops – is sold yearly to town residents and often for shorter periods to visitors and can be obtained in person in every town hall – typically through the selectmen’s office. Bring the permit with you on the water. Look out for areas posted open or closed to shellfishing, which vary from year to year. Permits generally allow approximately a half-bushel of steamers or quahaugs a week; and one bushel of scallops weekly in season, though it may vary from town to town. Always measure shellfish before putting them in your basket. Shellfish wardens suggest buying a metal quahaug/steamer measuring device that can be hung on a rake or basket. Measures, baskets, dip nets, and rakes can be purchased at any of the Island’s tackle shops. The Aquinnah Shellfish Department distributes approximately two million quahaug seeds all around the Aquinnah side of Menemsha Pond, especially in shallow flats so people wading can get to them, says Shellfish Constable Brian Vanderhoop. Residents and summer visitors can head to the town parking at the end of West Basin Road and at the head of the pond, also known as Red Beach, for hard-shell clams. On the other side, access to the pond off State Road by the hatchery is another popular spot. About five years ago, steamer clams in Menemsha Pond, and all over the Cape, were devastated by leukemia, explains Brian. “We’re just trying to bring them back.” In terms of bay scallops, he says, there tend to be plenty in Menemsha Pond, but they’re usually out near the middle, making it difficult to use the viewing boxes and dip nets used by most recreational scallopers elsewhere. Fees: Seasonal family permit, $30 for clams, $75 for scallops (non-resident permit, $100 for clams, $375 for scallops); non-resident two-week clam permit, $40; non-resident weekly clam permit, $25. Fees: Year-round residential family shellfish permit, $25 (seniors over seventy, free; non-residents, $50); non-resident weekly permit, $25. For quahaugs and steamers in Katama Bay, head to areas around the boat ramp off Edgartown Bay Road before low tide, suggests Paul Bagnall, the town’s shellfish constable. Kayakers or boaters might try loading at the boat ramp and checking shallow sandbars for productive quahaug spots. When Sengekontacket Pond is not closed to shellfishing (as it is this summer), look for the family-area shellfish signs along the shore on the Beach Road side to get quahaugs. On the other side of Sengekontacket, the landing off the Boulevard is another access point. In the fall, recreational scallopers will head to Katama Bay and Cape Pogue Bay. Edgartown Great Pond has not had a good fall oyster season in four or five years, says Paul, though efforts to rebuild oyster populations there are ongoing. Fees: Year-round residential family shellfish permit, $50 (non-resident, $250); non-resident one-day permit, $50. Sengekontacket, a good spot for quahaugs when it’s open, will be closed to shellfishing for the fourth summer in a row. Sengekontacket has historically been the biggest producer of quahaugs for us, says OB Shellfish Constable Dave Grunden, and there’s easy access right along Beach Road when it’s open in the off-season. Dave says everything will be open in Lagoon Pond this year. Both water bodies are seeded yearly for quahaugs, steamers, and bay scallops. In October, hundreds of recreational scallopers head to Lagoon Pond, especially on opening weekend before commercial scalloping season starts. Oak Bluffs doesn’t have good habitat for oysters, notes Dave. Fees: Year-round residential family shellfish permit, $35 (non-resident, $300); non-resident month-long permit, $75; non-resident two-week permit, $50; non-resident weekly permit, $25. Look for public access spots in both Lagoon Pond and Lake Tashmoo. Two spots to gain access to Tashmoo, good for soft-shell clams and quahaugs, include the boat ramp at the end of Lake Street and from the Tashmoo parking lot near the ocean opening down Daggett Avenue to Herring Creek Road, which opens to the nearby shallow flats, a popular family spot. One area near these flats will be closed this year for seeding; the other side will remain open. There are also a few Martha’s Vineyard Land Bank parking spots and access to Tashmoo above Drew Cove off Lambert’s Cove Road. Fees: Year-round family shellfish permit, $40 (seniors over sixty-five, $5; non- residents, $400); non-resident monthly permit, $75; non-resident weekly permit, $25. Tisbury Great Pond holds both oysters and soft-shell clams, but the water is not salty enough for quahaugs. If you don’t live around Tisbury Great Pond, the best access is at the Sepiessa Boat Launch in Tiah’s Cove. From there, Johnny Hoy, a commercial shellfisherman (also a well-known musician and mason), who knows the pond, says soft-shell clams can be found along shore at all the points and at the mouths of the coves, accessible by boat or kayak. Don’t overlook the stout razor clams in the pond; he says, “They’re delicious.” This pond is a good spot to go crabbing in the summer and early fall, and reports for this year look good. “It’s going to be crab heaven down there,” Johnny predicts for July and August. Fees: Year-round residential family shellfish permit, $25 (non-resident, $150); short-term permits are not offered. Edgartown Seafood Market. “All our shellfish is local – that’s all we sell,” says owner Dan Larsen. Like his sister Betsy, who owns Larsen’s in Menemsha, and brother Louis, owner of the Net Result in Tisbury, he grew up the son of a commercial fisherman. He also worked in the business himself before opening Edgartown Seafood in 1986. You’ll find a raw bar, lobsters cooked to order, fried clams, and plenty of Vineyard shellfish to cook at home. 138 Cooke Street, Edgartown, 508-627-3791. Larsen’s Fish Market. From inside the tiny raw bar at this Menemsha fish market, members of the Larsen clan open pristine Vineyard oysters, cherrystones, and littlenecks, while you wait. Somehow they also cook to order between 200 and 250 lobsters each day in the height of the season, says owner Betsy Larsen, who began working in the market (opened by her parents) when she was fourteen and started running it when she was nineteen. About 85 to 90 percent of the shellfish sold there comes from local waters, she notes. Get the full Vineyard shellfish experience by eating outside along the dock or walking a few steps to Menemsha Beach. 56 Basin Road, Menemsha, 508-645-2680. Menemsha Fish Market. There’s plenty of locally sourced shellfish here, plus a raw bar and lobsters cooked to order – all overseen by Stanley Larsen, a former Chilmark shellfish constable for nineteen years and fish market owner for the past seven (and cousin to the other Larsens in the fish-market business). “I know where they’re coming from,” says Stanley, who also supplies the market with wild blue mussels he collects himself from Menemsha Pond. “This store [formerly Poole’s Fish Market] has been here supporting local fishermen since 1946.” 54 Basin Road, Menemsha, 508-645-2282. John’s Fish Market/Sandy’s Fish & Chips. “I only buy local shellfish,” says owner Sandra Healy, and she doesn’t have to look far. Her son, Glenn Pachico, is a commercial fisherman and supplies the market with steamers, littlenecks, and lobster. You can get your lobster fix either in lobster salad served on a roll or whole, cooked to order, or sample a few littlenecks and oysters while the kids enjoy a soft-serve cone. This family market was started by Glenn’s grandfather, John Pachico. 5 Martin Road at the corner of State Road, Tisbury, 508-693-1220. The Net Result Fish Market & Take-out. At this market, about twenty different Vineyard shellfish suppliers bring in fresh oysters, lobsters, quahaugs, and steamers – available for purchase and in every preparation possible through the takeout and sushi bar. “You prefer to do as much as you can locally,” says owner Louis Larsen. The son and grandson of commercial fishermen, Louis opened what was the first year-round fish market down-Island twenty-five years ago this July Fourth, after a career on the water fishing for lobsters, swordfish, cod, and sea scallops, and shellfishing inshore for oysters and quahaugs. The quality at this market reflects a lifetime of fishing experience. Tisbury Marketplace, 79 Beach Road, Tisbury, 508-693-6071. MenemshaCache. Roxane Ackerman began farming oysters in the mid-nineties and uses floating bags on long lines in Menemsha Pond by Split Rock in Aquinnah – hence the name of her Split Rock Oysters, described as meaty and briny. You can find them at the West Tisbury Farmer’s Market or enjoy them at her daughter Faith Vanderhoop’s Seafood Shack overlooking the Cliffs in Aquinnah. 508-645-9061. Signature Oyster Farm. At twenty-six, Ryan Smith is the youngest person to join the commercial oyster ventures in Katama Bay, helped along the way by more experienced oyster growers such as Jack Blake and Scott Castro. Four years into it, he’s teamed up with his wife, Julia, and his father, Joe, a commercial fisherman, and says they have 700,000 oysters growing, of which he expects half will be available for restaurants, raw bars, caterers, and markets. 774-563-0950. Sweet Neck Farm. Jack Blake, a commercial fisherman, farms oysters in Edgartown’s Katama Bay, a job that brings him out on the water nearly every day, tending to about 850,000 oysters growing from seed. After his marriage last year, Jack was joined on the water by his wife, Sue. Sweet Neck oysters, a Vineyard favorite for their balanced sweet and briny flavor, have been recognized off-Island as well. Their “Sweet Petites” tied for third place for best taste in the 2008 First Invitational Oyster Tasting event in Providence, among nineteen oyster varieties from Maine to Maryland. He delivers the oysters in boxes of one hundred, but will waive the minimum for those willing to pick them up. 508-627-8347. The following shellfish recipes were originally published along with this article.